Back in 2008 when I first suspected my wife had sleep apnea, I spent a lot of time in online forums. What was I looking for? Well, for one thing, I was trying to figure out how people were coping with this life-draining condition from day to day. There were a lot of people in the forums trying to help each other out – and there still are. Reading all of that advice got me thinking: “Why aren’t these people asking their doctor for help?” I quickly learned that while some people had well-meaning and helpful doctors, others had doctors who didn’t have the time of day for them. It’s the last comment that really gets me. I don’t want to make generalizations here, because I know there are a lot of smart people who got into medicine because they want to help others, they want to make a difference in the world. But it seems like there are a heck of a lot of others who just want to make a lot of money! And it’s getting worse every year, with the healthcare industry turning into one big machine for generating profits. And is it just me, or is the “bedside manner” of doctors becoming worse by the day? That question popped into my head (again) a couple of weeks ago when I received an email from one of my website readers. The email was from a lady I’ll call Mary (she didn’t want her real name used). Mary recently went for a sleep study, and expected the result to come back bad. So she did some Google searches and came across my site. She signed up for my free e-course on sleep apnea treatments that DON’T involve CPAP. At the end of that e-course I offer a free document that I call a “cheat sheet”. 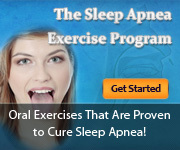 It’s a couple of pages of bullet points that summarize the best alternative sleep apnea treatments – treatments that have all been proven in scientific trials to cure – or significantly reduce – sleep apnea. And NONE of them involve using CPAP for the rest of your life! Well, Mary expected her sleep study to come back apnea-positive, and she figured her doctor would recommend the knee-jerk solution of most doctors: CPAP. Mary can be a bit claustrophobic, and like a lot of other people the thought of wearing a “Darth Vader mask” to bed every night didn’t exactly make her jump for joy. So she printed off my cheat sheet with a list of alternatives to CPAP, and she brought it into her doctor on the big day. “My doctor came into the office like he normally does – no smalltalk, all business. He sat down in his chair and took a look at the results of my sleep study. Without looking up he said the study showed I have moderate sleep apnea. Then he started to write me a prescription for CPAP equipment. So I decided to make a suggestion. I said “Doctor, I have this sheet of sleep apnea treatments that I’d like to discuss, instead of going straight for the CPAP“. Does that story sound familiar? Frankly, I would find it unbelievable. But I’ve heard similar stories so many times – of doctors refusing to acknowledge other treatments besides CPAP (or maybe dental appliances), of a healthcare industry that’s only concerned with profits, not people – that reality has set in. I think we’re facing an epidemic – of an industry that’s increasingly focused on money and doctors who only look out for number one.